Considered locking in a Damascus vacation package? It's a piece of cake with Expedia, and you'll be able to buy some nice dinners or presents for your friends back home with the money you save. You can choose from more than 400 partner airlines and 321,000 worldwide properties via our extensive database of flights and lodgings. Fly with who you want, stay wherever you want — now that's the perfect vacation! Still undecided? There is no extra fee from us for changing almost any reservation. It can be really nice to just stroll around the streets when you're somewhere new, but sometimes it's sensible to make a plan. Grab your travel schedule — we have plenty of fantastic ideas for your upcoming Damascus vacation. What about some snowboarding? It's among the most popular things to do in the wider region and the perfect excuse to head outdoors. Still got time to spare? If you're hungry for more action, jump at the chance to do some skiing too. Preparing for your trip to Damascus? Planing to fly in? You'll be greeted by a crowd of friendly faces at Scranton International Airport (AVP). It's located 45 miles (72 km) southwest of the central area. 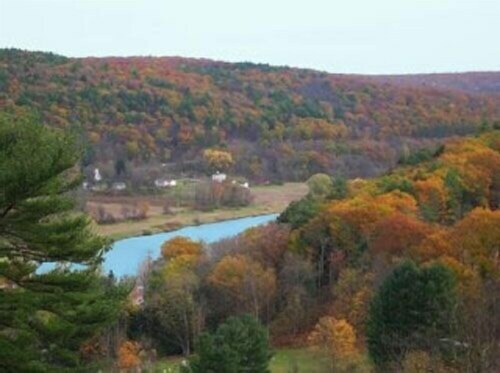 Situated on a river, this historic vacation home is within 12 mi (20 km) of Upper Delaware Scenic and Recreational Area, Bethel Woods Center For The Arts, and Carousel Water and Fun Park. Fort Delaware Museum is 11.1 mi (17.9 km) away. 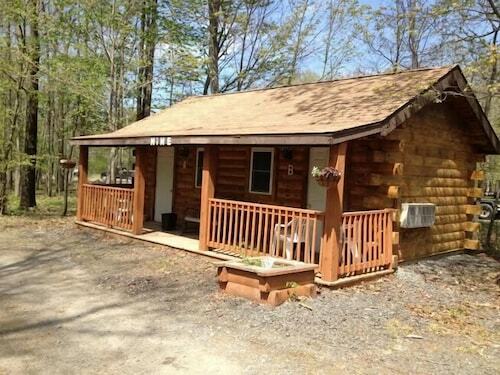 Situated in a rural location, this property is within 16 mi (25 km) of Bethel Woods Center For The Arts, Bethel Woods, and Upper Delaware Scenic and Recreational Area. Fort Delaware Museum and White Sulphur Springs Synagogue are also within 20 mi (32 km). Situated in Liberty, this motel is 0.8 mi (1.3 km) from Grossinger Country Club and 2.5 mi (4.1 km) from Sullivan County Golf and Country Club. White Sulphur Springs Synagogue and Neversink Dam are also within 9 mi (15 km). Situated on a lake, this spa hotel is within 9 mi (15 km) of Harmony Presents, Lake Wallenpaupack, and Ritz Company Playhouse. Dorflinger Glass Museum and Zane Grey Museum are also within 9 mi (15 km). 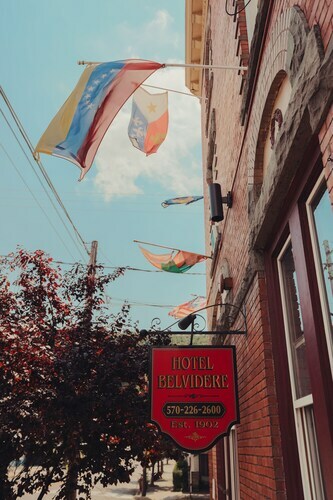 Situated in Jeffersonville, this inn is 5.4 mi (8.6 km) from Bethel Woods and within 12 mi (20 km) of Bethel Woods Center For The Arts and White Sulphur Springs Synagogue. Fort Delaware Museum is 12.3 mi (19.8 km) away. 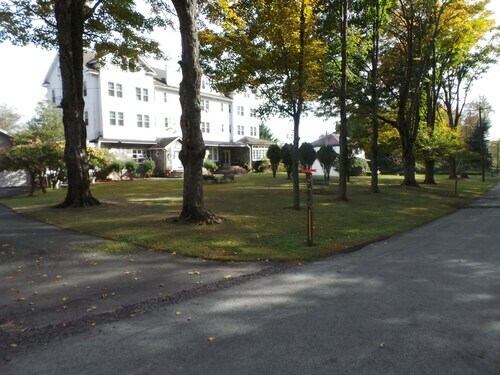 Situated in Hawley, this hotel is 0.1 mi (0.2 km) from Ritz Company Playhouse and 1.3 mi (2.1 km) from Lake Wallenpaupack. Harmony Presents is 0.6 mi (1 km) away. 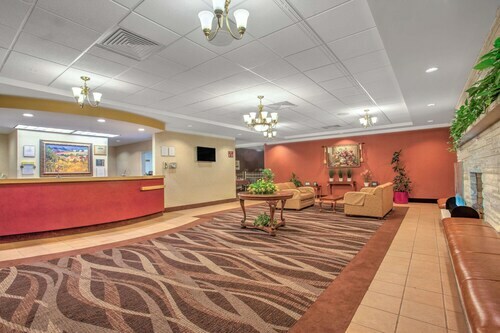 Set in Hawley, this family-friendly hotel is within 9 mi (15 km) of Carousel Water and Fun Park, Upper Delaware Scenic and Recreational Area, and Harmony Presents. Ritz Company Playhouse and Zane Grey Museum are also within 9 mi (15 km). Located in the mountains, this family-friendly resort is within 9 mi (15 km) of Wayne County Courthouse, Lake Wallenpaupack, and Honesdale Golf Club. Wayne County Historical Society Museum and Dorflinger Glass Museum are also within 9 mi (15 km).